This book provides a comprehensive, state-of-the art summary of platelet rich plasmas (PRPs) in the field of regenerative medicine. The book begins with an overview of the basic science behind PRP, describing the role of platelets and growth factors followed by the most important biological effects expected from the use of PRPs. 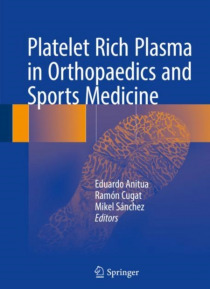 Platelet Rich Plasma in Orthopaedics, Sports Medicine and Maxillofa… cial Surgery includes numerous contributions detailing the current use of PRPs in clinical practice. From the origins in oral and maxillofacial surgery, to the latest advances in orthopaedics and sports medicine including the use of Platelet Rich Growth Factors (PRGF) in muscle, bone, tendon, ligament and nerve injuries, this book provides a wide scope of the topic. The volume concludes with chapters from experts in biology, orthopaedics, oral and maxillofacial surgery, where the convergence of expertise is leading to unprecedented insights into how to minutely control the in vivo fate and function of PRGF. This book will provide a useful resource for physicians and researchers interested in learning more about this rapidly growing area of biomedical treatment.